The 260-million-year-old Emeishan volcanic province of southwest China overlies and is interbedded with Middle Permian carbonates that contain a record of the Guadalupian mass extinction. Sections in the region thus provide an opportunity to directly monitor the relative timing of extinction and volcanism within the same locations. These show that the onset of volcanism was marked by both large phreatomagmatic eruptions and extinctions amongst fusulinacean foraminifers and calcareous algae. The temporal coincidence of these two phenomena supports the idea of a cause-and-effect relationship. The crisis predates the onset of a major negative carbon isotope excursion that points to subsequent severe disturbance of the ocean-atmosphere carbon cycle. 1 School of Earth and Environment, University of Leeds, Leeds LS2 9JT, UK. 2 Faculty of Earth Sciences, China University of Geosciences, Wuhan, Hubei 430074, China. 3 Department of Earth and Environmental Science, The Open University, Milton Keynes MK7 6AA, UK. 4 Department of Earth Sciences, Pokfulam Road, University of Hong Kong. 5 Department of Bioengineering, University of Strathclyde, Wolfson Building, 106 Rottenrow, Glasgow G4 0NW, UK. I have emailed and asked about the paper. If anyone else can get it to me faster...;) Dr Wignall sent me a copy. Munchy Crunchy Belarus? Or More Posturing? The future of Belarus can no longer depend on Russia, President Alexander Lukashenko declared Friday, a day after talks between the once close ex-Soviet allies ended in acrimony. Lukashenko, whose government was dubbed Europe's last dictatorship by the United States but is now courting closer ties with the European Union, said the days of Minsk "bowing down" to Moscow were over. His extraordinary anti-Moscow tirade came a day after his talks with Russian Prime Minister Vladimir Putin in Minsk were overshadowed by bitter disputes over Russian loans to Belarus and recent Belarussian overtures to the EU. "It's not working out with Russia. We don't need to bow down. We don't need to whine and cry," his press service quoted Lukashenko as telling his government. "We need to look for our happiness on a different part of the planet. I consciously say this in public. From this day on, that time has come to an end and another time has started." mmm. This is gonna be "fun" to watch play out. How Russia reacts ought to be interesting. And telling. In 2002, British viewers of the BBC put Winston Churchill, Princess Diana and 19th century engineer Brunel at the top of their list of national heroes. Then,, last year, Russian viewers of Moscow’s “Rossiya” channel offered Aleksandr Nevsky, Stolypin and Stalin as their favorite national heroes. I was reading an article about only what could be termed Russian Exceptionalism when I read the above paragraph...I spewed coffee all over. I wonder what the world would think if a listing like that had been made for Germans and - forgive me German readers, truly - it had come out Arminius, Frederick the Great and Hitler? When Benno Ohnesorg was shot on June 2, 1967 by a policeman in West Berlin during a demonstration against the Shah of Iran, the young German student became a martyr for a generation of left-wing activists. The killing triggered the radicalization of the mass protest movement in West Germany, which directed its anger against the police, the government and the conservative establishment. The poignant image of a woman cradling Benno Ohnesorg's head as he lay dying on the ground became etched in Germans' minds. But now it has emerged that the police officer who pulled the trigger was actually a spy working for the Stasi, East Germany's dreaded secret police. The revelation has stunned Germans and thrown a whole new light on Germany's past. A researcher working for a government agency that manages the old communist regime's secret police records stumbled across the new information as she was carrying out research on another project. The former West Berlin cop, Karl-Heinz Kurras, has a bulging Stasi file of some 7,000 pages. Kurras, it turns out, was a member of the East German SED Communist Party as well as an active Stasi agent. He joined the West Berlin police at the age of 22 in 1950, but five years later he switched sides and went to the authorities in East Berlin. Kurras wanted to move to East Germany but he was persuaded to stay with the police in West Berlin and spy for the Stasi under the cover name of "Otto Bohl". For years, Kurras delivered sensitive information about Allied soldiers and police officers to his controllers in East Berlin. According to government officials, he was rewarded handsomely for his services. One payment alone in 1966, for instance, came to 4,500 German marks, worth just over $1000 at the time. So what-if "Bohl" is unmasked by accident by the East German government. What would the impact be? There's a news story about it here. I am a little unconvinced that it would derail the student movement as it was. There was plenty of gunpowder laying around and something was going to light that boomski. The finding confirms that astrometry could be a powerful planet-hunting technique for both ground- and space-based telescopes. For example, a similar technique would be used by SIM Lite, a NASA concept for a space-based mission that is currently being explored. The newfound exoplanet is about 20 light-years away in the constellation Aquila. It is a gas giant, with a mass six times that of Jupiter’s, and an orbit far enough away from its star to be labeled a “cold Jupiter” similar to our own. In reality, the planet’s own internal heat would give it an Earth-like temperature. The planet’s star, called VB 10, is tiny. It is what’s known as an M-dwarf and is only one-twelfth the mass of our sun, just barely big enough to fuse atoms at its core and shine with starlight. For years, VB 10 was the smallest star known — now it has a new title: the smallest star known to host a planet. In fact, though the star is more massive than the newfound planet, the two bodies would have a similar girth. They tried this with Bernard's Star and failed to find anything...despite some misstarts. There are lessons to be taken from even the most rant-y or misguided efforts of pseudo-science and un-science and general misrepresentations of science provided you know where to find them. One aspect of the near congenital media screw-up of science is the idea that one vocal dissenter to a well recognised hypothesis or theory makes this either controversial or uncertain. In fact I recently found a great quote by a science journalist on this very issue: “Journalism, which relies on “balance”, has never dealt with science, which relies on consensus”. (Sharon Weinberger). Please, PLEASE, PLEASE go read David Hone's commentary on science vs journalism and the lone dissenter. He really hits it on the head and I wish journalists and those that read the popsci writeups will pay attention. Closely. A mass extinction some 260 million years ago may have been caused by volcanic eruptions in what is now China, new research suggests. The so-called Guadalupian Mass Extinction, devastating marine life around the world, was preceded by massive eruptions in the Emeishan province of Southwest China, researchers led by Paul Wignall of Britain's University of Leeds report in Friday's edition of the journal Science. Because the eruptions occurred in a shallow sea the researchers were able to study both the volcanic rock and the overlying layer of sedimentary rock containing fossilized marine life, making it possible to compare dates. I went looking for a paper, but I haven't been able to find it in Science. Note: THIS IS A CORRELATION, NOT VERIFIED CAUSATION. I really like that Wignall acknowledges that. That's really kewl. A Chinese space scientist said that his country is considering the feasibility of a manned lunar landing mission sometime between 2025 and 2030. China is also planning a sample return mission to the Moon by 2017, said Ye Peijian, chief designer of the China’s Chang’e Project. “Through the development of lunar probes, we have made constant progress of the ability to explore the outer space,” Ye was quoted as saying by the China News Service. Chang’e -1 launched successfully in 2007 and orbited the Moon for 16 months before conducting a controlled impact on the Moon’s surface earlier this year. The satellite mapped and created three-dimensional images of the lunar surface. Several performance tests were carried out while Chang’e-1 was in orbit to give engineers experience in orbit adjustment, and to test the spacecraft’s capability. According to Ye, China will launch the second lunar probe Chang’e-2 in 2010 which will conduct research at a 100-kilometer-high moon orbit as the preparation for a soft landing by using variable thrusters with the Chang’e-3, which will include a lunar rover, currently in development. Increased encephalization, or larger brain volume relative to body mass, is a repeated theme in vertebrate evolution. Here we present an extensive sampling of relative brain sizes in fossil and extant taxa in the mammalian order Carnivora (cats, dogs, bears, weasels, and their relatives). By using Akaike Information Criterion model selection and endocranial volume and body mass data for 289 species (including 125 fossil taxa), we document clade-specific evolutionary transformations in encephalization allometries. These evolutionary transformations include multiple independent encephalization increases and decreases in addition to a remarkably static basal Carnivora allometry that characterizes much of the suborder Feliformia and some taxa in the suborder Caniformia across much of their evolutionary history, emphasizing that complex processes shaped the modern distribution of encephalization across Carnivora. This analysis also permits critical evaluation of the social brain hypothesis (SBH), which predicts a close association between sociality and increased encephalization. Previous analyses based on living species alone appeared to support the SBH with respect to Carnivora, but those results are entirely dependent on data from modern Canidae (dogs). Incorporation of fossil data further reveals that no association exists between sociality and encephalization across Carnivora and that support for sociality as a causal agent of encephalization increase disappears for this clade. No time to comment in depth. If tis holds up, it harpooned and dragged in a hypothesis that has been used repeatedly. Over the past six months, your husband has been causing quite a commotion in our store. We cannot tolerate this behavior and have been forced to ban both of you from the store. Our complaints against your husband are listed below and are documented by our video surveillance cameras. Go read the rest at Mexico Today. It's hilarious. Nonfunctional visual genes are usually associated with species that inhabit poor light environments (aquatic/subterranean/nocturnal), and these genes are believed to have lost function through relaxed selection acting on the visual system. Indeed, the visual system is so adaptive that the reconstruction of intact ancestral opsin genes has been used to reject nocturnality in ancestral primates. To test these assertions, we examined the functionality of the short and medium- to long-wavelength opsin genes in a group of mammals that are supremely adapted to a nocturnal niche: the bats. We sequenced the visual cone opsin genes in 33 species of bat with diverse sensory ecologies and reconstructed their evolutionary history spanning 65 million years. We found that, whereas the long-wave opsin gene was conserved in all species, the short-wave opsin gene has undergone dramatic divergence among lineages. The occurrence of gene defects in the short-wave opsin gene leading to loss of function was found to directly coincide with the origin of high-duty-cycle echolocation and changes in roosting ecology in some lineages. Our findings indicate that both opsin genes have been under purifying selection in the majority bats despite a long history of nocturnality. However, when spectacular losses do occur, these result from an evolutionary sensory modality tradeoff, most likely driven by subtle shifts in ecological specialization rather than a nocturnal lifestyle. Our results suggest that UV color vision plays a considerably more important role in nocturnal mammalian sensory ecology than previously appreciated and highlight the caveat of inferring light environments from visual opsins and vice versa. Anyone have a cloning service so I can have time to comment!!! As the frozen soil in the Arctic thaws, bacteria will break down organic matter, releasing long-stored carbon into the warming atmosphere. At the same time, plants will proliferate, nurtured by balmier temperatures, more nutrients from decomposing soil and the increasing abundance of the greenhouse gas they depend on for growth. These connected but contrasting changes have raised a question for scientists who study the causes and consequences of global climate change: Will the shrubs and incipient forests spreading across the Arctic compensate for the permafrost's rising release of carbon, blunting its impact on a warming planet? Or, with twice as much carbon locked up in the permafrost as now present in the atmosphere, will the lush growth become overwhelmed -- like a kitchen sponge put down to stem a water main break? Researchers led by a University of Florida ecologist may have an answer. In a paper set to appear May 28 in the journal Nature, the team reports experimental results suggesting tundra plant growth may keep up with rising carbon dioxide initially. But if thawing continues in a warmer world, the permafrost will spew carbon for decades, and the plants will become overwhelmed -- unable to sop up the excess carbon despite even the most vigorous growth. "At first, with the plants offsetting the carbon dioxide, it will appear that everything is fine, but actually this conceals the initial destabilization of permafrost carbon," said Ted Schuur, a UF associate professor of ecology and lead author of the paper. "But it doesn't last, because there is so much carbon in the permafrost that eventually the plants can't keep up." Schuur noted most of the 13 million square kilometers, or roughly 5 million square miles, of permafrost in Alaska, Canada, Siberia and parts of Europe remain frozen. However, thawing already occurring around its southern edges is expected to expand this century. Should that occur, this study suggests the permafrost could lose in the range of 1 gigaton of carbon, or 1 billion tons, per year – about the same order of magnitude as being added by current deforestation of the tropics, another large biospheric source, Schuur said. While burning fossil fuels contributes considerably more carbon, about 8.5 gigatons annually, that process can at least in theory be controlled – whereas once the permafrost thaw begins, it sets up a self-reinforcing loop far from human activity and potentially difficult to stop. The melting of the Greenland Ice Sheet this century may drive more water than previously thought toward the already threatened coastlines of New York, Boston, Halifax and other cities in the northeastern United States and Canada, according to new research. Results of the study are being published this week in Geophysical Research Letters. They suggest that moderate to high rates of ice melt from Greenland may shift ocean circulation by about 2100, causing sea levels off the northeast coast of North America to rise by about 30 to 51 centimeters (12 to 20 inches) more than other coastal areas. The research builds on recent reports that have found that sea level rise could adversely affect North America, and its findings suggest that the situation is even more urgent than previously believed. "If the Greenland melt continues to accelerate, we could see significant impacts this century on the northeast U.S. coast from the resulting sea level rise," says scientist Aixue Hu, the paper's lead author. Hu is at the National Center for Atmospheric Research (NCAR) in Boulder, Colo. "Major northeastern cities are directly in the path of the greatest rise." A study in Nature Geoscience in March warned that warmer water temperatures could shift ocean currents in a way that would raise sea levels off the Northeast by about eight inches more than the average global sea level rise that is expected with global warming. But it did not include the additional impact of Greenland ice, which at moderate to high melt rates would further accelerate changes in ocean circulation and drive an additional 10 to 30 centimeters (4 to 12 inches) of water toward northeastern North America on top of the average global rise. The new research was funded by the U.S. Department of Energy and by NCAR's sponsor, the National Science Foundation (NSF). It was conducted by scientists at NCAR, the University of Colorado at Boulder, and Florida State University. To assess the impact of Greenland ice melt on ocean circulation, Hu and his coauthors used the Community Climate System Model, an NCAR-based computer model that simulates global climate. They considered three scenarios: the melt rate continuing to increase by 7 percent a year, as has been the case in recent years, or the melt rate slowing down to an increase of either 1 or 3 percent a year. If Greenland's melt rate slows down to a 3 percent annual increase, the study team's computer simulations indicate that the runoff from its ice sheet could alter ocean circulation in a way that would direct about a foot of water toward the northeast coast of North America by 2100. This would be on top of the average global sea level rise expected as a result of global warming. Although the study team did not try to estimate that mean global sea level rise, their simulations indicated that melt from Greenland alone under the 3 percent scenario could raise sea levels by an average of 53 centimeters (21 inches). If the annual increase in the melt rate dropped to 1 percent, the runoff would not raise northeastern sea levels by more than the 8 inches found in the earlier study in Nature Geoscience. But if the melt rate continued at its present 7 percent increase per year through 2050 and then leveled off, the study suggests that the northeast coast could see as much as 51 centimeters (20 inches) of sea level rise above a global average that could be several feet. However, Hu cautioned that other modeling studies have indicated that the 7 percent scenario is unlikely. To time to comment again! oy! Read about Darren, Matt and Mike's blog posts about their paper comparing sauropod vertebrae to real live animals, etc. Long story short. 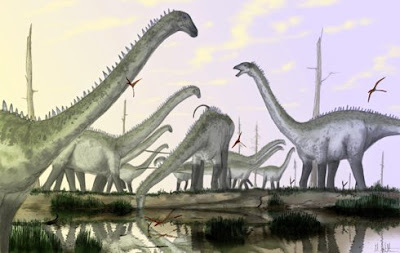 Sauropods really DID hold their heads up. Read about it here and here. The official name is Curiosity. New fossil findings discovered by scientists at UC Santa Barbara challenge prevailing views about the effects of "Snowball Earth" glaciations on life, according to an article in the June issue of the journal Nature Geoscience. By analyzing microfossils in rocks from the bottom of the Grand Canyon, the authors have challenged the view that has been generally assumed to be correct for the widespread die-off of early life on Earth. "Snowball Earth" is the popular term for glaciations that occurred between approximately 726 and 635 million years ago and are hypothesized to have entombed the planet in ice, explained co-author Susannah Porter, assistant professor of earth science at UCSB. 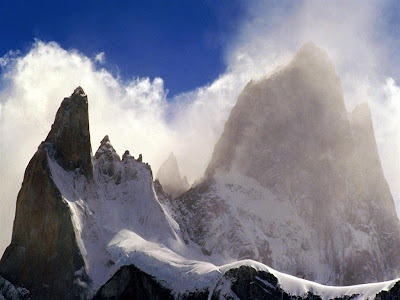 It has long been noted that these glaciations are associated with a big drop in the fossil diversity, suggesting a mass die-off at this time, perhaps due to the severity of the glaciations. However, the authors of the study found evidence suggesting that this drop in diversity occurred some 16 million or more years before the glaciations. And, they offer an alternative reason for the drop. A location called the Chuar Group in the Grand Canyon serves as "one of the premier archives of mid-Neoproterozoic time," according to the article. This time period, before Snowball Earth, is preserved as a sort of "snapshot" in the canyon walls. The scientists found that diverse assemblages of microscopic organic-walled fossils called acritarchs, which dominate the fossil record of this time, are present in lower rocks of the Chuar Group, but are absent from higher strata. 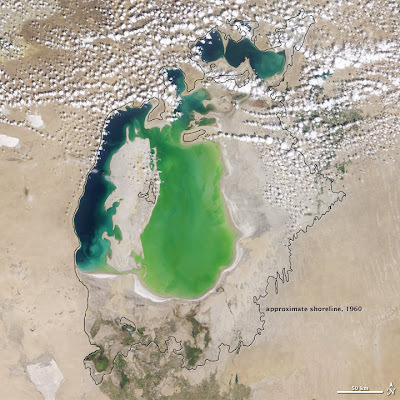 In their place, there is evidence for the bacterial blooms that, the authors hypothesize, most likely appeared because of an increase in nutrients in the surface waters. This process is known as eutrophication, and occurs today in coastal areas and lakes that receive abundant runoff from fertilizers used in farming. "One or a few species of phytoplankton monopolizes nutrients at the expense of others," said Porter, explaining the die-off of diverse acritarchs. "In addition, the algal blooms result in high levels of organic matter production, which we see evidence of in the high organic carbon content in upper Chuar Group rocks. In fact, the organic carbon content is so high in the upper Chuar Group, oil companies were interested in the Chuar Group as a possible source of oil and natural gas." As a result of high levels of organic matter, oxygen levels in the water can become depleted, resulting in widespread "dead zones." Porter and colleagues also found evidence for extreme anoxia in association with the bacterial blooms. No time to comment again. Evil meetings coming up. Vladimir Putin, Russia's prime minister and former president, is not renowned for his love of literature. But on Sunday he gave Russian journalists an unexpected reading tip: the diaries of Anton Denikin, a commander in the White Army that fought the Bolsheviks after the Revolution in 1917. Putin's words are seen as the latest in an ongoing volley of pointed warnings to the West not to meddle in Ukraine, a country with such close historical and cultural ties to Russia that the Kremlin considers it firmly within its sphere of interests. Moscow has reacted angrily to Ukrainian President Viktor Yushchenko's attempts in recent years to gain NATO membership, and to a recent agreement in March for the European Union to help modernize Ukraine's aging gas transport system. "This agreement is Exhibit A in Moscow's collection [of complaints]," says Trenin. "It's evidence that Europe is concluding bilateral deals with Ukraine that undermine Russia's interests." Russian leaders have also expressed concerns about the E.U. 's Eastern Partnership program, unveiled earlier this month, which aims to deepen economic and political ties with six former Soviet states, including Ukraine. At the E.U.-Russia summit in Khabarovsk over the weekend, Russian President Dmitry Medvedev said E.U. officials had "failed to persuade" him that it was not harmful to Russian interests. "What confuses me is that some states... see this partnership as a partnership against Russia," he said. Putin's reference on Sunday to "Little Russia" - a term used during the Russian Empire to describe parts of modern-day Ukraine that came under Tsarist rule - has raised hackles in Ukraine, where many consider it demeaning and offensive. "These comments by Putin should be taken very seriously," says Olexandr Paliy, a political analyst with the Institute of Foreign Policy at the Ukrainian Ministry of Foreign Affairs' Diplomatic Academy. "Russia is engaged in a propaganda war against Ukraine, designed to convince the West not to support Ukraine. Russia doesn't understand cooperation with equals, only with subordinates." Putin is not known for his tact when speaking of Russia's western neighbor, which declared independence from the Soviet Union in 1991. In April 2008, a source told Russia's Kommersant newspaper how Putin described Ukraine to George Bush at a NATO meeting in Bucharest: "You don't understand, George, that Ukraine is not even a state. What is Ukraine? Part of its territories is Eastern Europe, but the greater part is a gift from us." Two Moscow proposals last week – President Dmitry Medvedev’s suggestion that China help develop the Russian Far East and a Duma suggestion that Siberian river water be diverted to Central Asia – are adding to the outrage many Russians beyond the Urals feel, as the recent wave of protests in Vladivostok , toward the central government. In a commentary significantly entitled “The Question: TOGETHER or IN PLACE OF Russia?” Alekandr Protsenko argues that Medvedev’s call for Beijing to invest in the Russian Far East represents a threat to Russia’s territorial integrity, especially since Moscow lacks the resources to do so itself (svpressa.ru/issue/news.php?id=9090#). Eight months ago, Protsenko points out, Medvedev himself said that “Russia could lose the Far East if it does not take immediate measures for its development.” But now that Moscow’s strategic plan for the region is nearly ready for release, it is obvious Moscow does not have the money to invest there. So what does this tell us? The Russians are continuing to pull away from the West, which is obvious and was happening already. However, the Russians are going deeper into the pockets of the Chinese. Their hope is that the Chinese will help develop their regions that they lack the cash for (it does work as a model, Britain and other European nations did that for the US and other places). The Russian leadership are also hoping that together, they will be able to counterbalance the US and Europe in the world. I don't think that this will work. The Chinese will be doing the countering...the Russians will, at best, end up as a resource exporter to China. At worst...see what I wrote 3 years ago. The reason that I question whether it is true or not is the source, The Register couldn't get HPC right if there was a no left turn sign in front of its nose. Link at the top. Seriously, read it. The nearly intact fossil of an ancient sloth that lived 5 million years ago has been unearthed in Peru, a find about 4 million years older than similar ones discovered in the Americas, researchers said. The sloth was found beneath the cement floor of a house in the Andean region of Espinar in southern Peru when workers were installing a water system. Parts of a giant armadillo that has also been dated to 5 million years ago were also found nearby. The sloth, about 10 feet long, was an herbivore and lived during the Mio-Pliocene era, said paleontologist Rodolfo Salas of Peru's Natural History Museum and one of the scientists on the dig sponsored by the French government. "This skeleton of the sloth is especially important as it is the first complete skeleton of its kind that is 5 million years old in the Americas," he told Reuters. "Previously, discoveries have been made of partial skeletons of similar animals, but from the Pleistocene era, meaning from the last million years." The sloth was found at 13,000 feet above sea level. No time for commentary. Just to clarify though this is probably a Pliocene critter, but it does come close to being Miocene. The comment of Mio-Pliocene might have been a slip or a self correction that the reporter repeated verbatim. I really wish more of Xenarthra had made it into modern times in the New World. Or to be more specific more of Pilosa. Many scientists currently think at least 5 percent of humanity's carbon footprint comes from the concrete industry, both from energy use and the carbon dioxide (CO2) byproduct from the production of cement, one of concrete's principal components. 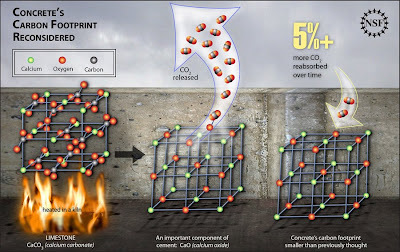 Yet several studies have shown that small quantities of CO2 later reabsorb into concrete, even decades after it is emplaced, when elements of the material combine with CO2 to form calcite. A study appearing in the June 2009 Journal of Environmental Engineering suggests that the re-absorption may extend to products beyond calcite, increasing the total CO2 removed from the atmosphere and lowering concrete's overall carbon footprint. While preliminary, the research by civil and environmental engineering professor Liv Haselbach of Washington State University re-emphasizes findings first observed nearly half a century ago--that carbon-based chemical compounds may form in concrete in addition to the mineral calcite-now in the light of current efforts to stem global warming. "Even though these chemical species may equate to only five percent of the CO2 byproduct from cement production, when summed globally they become significant," said Haselbach. "Concrete is the most-used building material in the world." Researchers have known for decades that concrete absorbs CO2 to form calcite (calcium carbonate, CaCO3) during its lifetime, and even longer if the concrete is recycled into new construction--and because concrete is somewhat permeable, the effect extends beyond exposed surfaces. It's decades away most likely, but it's an interesting idea all the same. 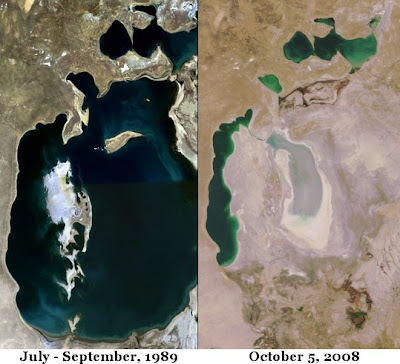 The Aral Sea is Dead! Long live the Aral desert?! Just hooked another sponsor. I'll have the announcement around Wednesday. One of the other teams remarked that there are really two projects involved in the LLC. The first is building the rocket. The second is programming the software to make it fly. I think he missed a step: getting the thing funded. Yes, you can pay out of your own pocket. I have been. Trust me! If I were single, at my salary, I could pay for this all. However, I am not and other than the very generous paypal drivers we had last fall, all cash has been through and by me. To make up for that, I have been chasing down sponsors. This ahs been an enormous amount of work. Far, far greater than I had anticipated, really. We've had some pretty good successes. In a couple cases, outstanding successes. However, it really is an obscene amount of work to get them. I was asked once by a member of another team how I was able to get my sponsors. He'd tried around, iirc, 8 places to try to get a sponsor. My response is you have gotta keep trying. I get maybe a 10% hit rate, That means, approximately, since I have 5 and shortly 6 sponsors, the number of presentations and pitches I've made is around 60. Sixty! In the past year and a half. Oh. and I still have a family with youngins. Oh, and a demanding day job. And a rocket to build. So, something like the LLC is really three projects in my not so humble opinion: bend, code, and beg. All three are full time jobs. Is it any surprise I get four hours of sleep per night? heh. Moments like these make for great morale boosters. Now, break over, back to machining. There's so much more to do. Wealthy nations, as history's biggest polluters, should cut greenhouse gas emissions by 40 percent from 1990 levels by 2020, China says in a policy document on climate change. The government also rolled out fresh help for solar power and other "green energy." The reductions China is calling for are based on the principles of "historical responsibility and fairness," the position paper says, and set a hard line ahead of international negotiations on addressing global warming. A U.N. conference set for December in Copenhagen aims to draft a new agreement on controlling carbon dioxide and other heat-trapping greenhouse gases that scientists say are causing the Earth to warm. Delegates will meet in Bonn, Germany, next month to begin discussing the text of that agreement. China's position paper was posted Thursday on the Web site of the National Development and Planning Commission, the country's main economic planning agency. First off, the West is struggling to get TO 1990 emissions. Secondly, *CHINA*, not the US, is the world's biggest emitter. If they continue to refuse to curb their own emissions, this is pointless: the Chinese are less carbon efficient than even the US. For an economy half the size of the US, they produce more carbon than we do. If they had one as large as the US, they'd be produced twice as much. if they had an economy as rich per capita, China would be producing almost nine times as much CO2 as the US. Third, keep in mind that China has outright stated that they will not be doing anything that may effect their economic growth until 2050. They have stated they will not be curbing CO2 emissions until then. Whatever the US, the West, the Developed World, does, China is going to more than make up for by itself. As I have said before, I am saying now, and will say again: Global Warming Is Inevitable. We need to start talking mitigation, folks. HR 990 must have died completely. Damnit, Pelosi. Structurally, this isn't much different. First vote whether or not to change the status. Second vote on which one to change to: statehood, independence, or free associated state (like the pacific islands, formerly the Trust Territories). None of them are what the Enhanced Commonwealthers want though. Interesting, Serrano is not one of the cosponsors. I suspect that once this left committee it'll get squashed by Madame Speaker again. 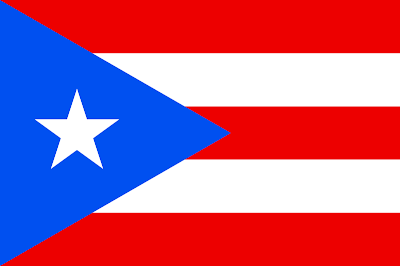 This is the move I expected though when the pro statehood party swept the election in PR. Russia Considers Ukraine Failed State? Fair Game? In a lengthy article in today’s Kyiv newspaper, “Den’,” Shcherbak says that “aggressive conversations relative to Ukraine and the possible dividing up of its territory are being conducted” now in Moscow by a variety of Russian nationalist politicians and analysts. Among the people he names are the followers of Konstantin Zatulin, the first deputy head of the Duma committee on compatriots and director of the Institute of CIS Countries, Aleksandr Prokhanov, the novelist and “Zavtra” commentator, and Aleksandr Dugin, the leader of the Eurasian Movement. oy. I need to write more about the Eurasia Soul, but, time, not my friend. In future conflicts, guided mortars could be “the next IED,” Center for Strategic and Budgetary Assessments (CSBA) analyst Tom Erhard said in remarks this morning at a congressional conference on Directed Energy Systems. Erhard noted that if the Dept. of Defense and industry don’t start taking seriously the need to field directed energy weapons, when insurgents inevitably start launching guided mortars at American forces, the military will have to rehash the whole sped-up acquisition process that we’ve seen in Iraq and Afghanistan. “Do we want to go through all that again? Do we want to go through JIEDDO again?” he asked. Andrew Krepinevich, Erhard’s boss at CSBA, added that “the canary in the mineshaft were the [mortar] attacks on the Green Zone” that peaked in 2006 and 2007, which exposed the need for better counter mortar defenses. Krepinevich also pointed to the Israeli / Hezbollah war in 2006 where Israeli air power was unable to knock out Hebollah’s rocket launching sites, forcing Israeli forces to storm prepared defenses in a messy ground war. Hezbollah fired some 3,900 rockets over the border during the fight, and while they were mostly ineffective (ignoring the psychological “win” they scored), Krepinevich pointed out the destruction that might have occurred if even one percent of those rockets were GPS guided. The answer, the analysts said, is fielding non-chemical, electrically generated Solid State Laser (SSL) technology that can act as a deterrent against both guided and unguided mortar fire. It also happens to be useful for grade A combatants too. Not just insurgents. Aircraft? UAVs? Possibly RPGs if you had something with a fast enough slew rate. Berkeley Lab anticipates several openings for post-doctoral fellows in the NERSC Division to address the challenges of petascale computing on new multicore architectures. The fellows will work with high-profile applications in the areas of bioscience, fusion, climate and material science as well as in the development of scalable algorithms and novel language implementations for modern petascale systems. The fellows will have access to leading edge computational platforms as well as prototypes of experimental systems and close interaction with DOE Office of Science Principal Investigators who are receiving significant allocations of high-end computer time under the ASCR Leadership Computing Challenge. Interaction with faculty and students of the University of California, Berkeley and other major research universities is available depending on the specific project. The fellows will have the opportunity to gain experience in the NERSC production environment facility and practical knowledge of the skills necessary for deployment of large-scale multi-user hardware and software. The fellow will participate in research projects to develop, analyze, and optimize performance of HPC applications and their run-time environment. This project may involve several of the following activities: analysis and optimization of parallel application programs; benchmarking these codes on systems from single CPUs to large scale HPC systems; the development of improved algorithms for multi-core systems; research in a specific computational application domain; publication and dissemination of these research activities through refereed publications and conference presentations. Required: PhD degree in computer science, computational science, applied mathematics or a related scientific/engineering application domain area is required. Excellent written and oral communication skills are required. Demonstrated ability to work independently, work collaboratively in an interdisciplinary team, and contribute to an active intellectual environment. Experience with code development in a UNIX/Linux - based environment. Desired: Experience in one or more of the following areas: (1) High-performance computing, (2) Domain science expertise relevant to biosciences, climate, fusion, or similar application fields, (3) Experience tuning and debugging large science applications, (4) Advanced HPC languages and methods (PGAS, CUDA, OpenCL, etc.). All positions require the completion of a background check. This is a one-year term appointment with the possibility of renewal. The Berkeley Lab offers competitive salaries for post-doctoral positions with excellent benefits. Link to the website to apply at the top. The best European locality for complete Eocene mammal skeletons is Grube Messel, near Darmstadt, Germany. Although the site was surrounded by a para-tropical rain forest in the Eocene, primates are remarkably rare there, and only eight fragmentary specimens were known until now. Messel has now yielded a full primate skeleton. The specimen has an unusual history: it was privately collected and sold in two parts, with only the lesser part previously known. The second part, which has just come to light, shows the skeleton to be the most complete primate known in the fossil record. We describe the morphology and investigate the paleobiology of the skeleton. The specimen is described as Darwinius masillae n.gen. n.sp. belonging to the Cercamoniinae. Because the skeleton is lightly crushed and bones cannot be handled individually, imaging studies are of particular importance. Skull radiography shows a host of teeth developing within the juvenile face. Investigation of growth and proportion suggest that the individual was a weaned and independent-feeding female that died in her first year of life, and might have attained a body weight of 650–900 g had she lived to adulthood. She was an agile, nail-bearing, generalized arboreal quadruped living above the floor of the Messel rain forest. 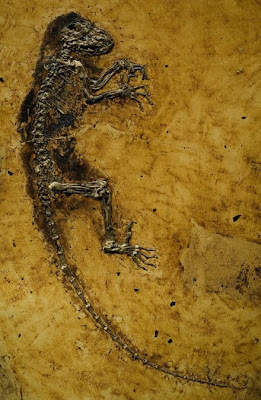 Darwinius masillae represents the most complete fossil primate ever found, including both skeleton, soft body outline and contents of the digestive tract. Study of all these features allows a fairly complete reconstruction of life history, locomotion, and diet. Any future study of Eocene-Oligocene primates should benefit from information preserved in the Darwinius holotype. Of particular importance to phylogenetic studies, the absence of a toilet claw and a toothcomb demonstrates that Darwinius masillae is not simply a fossil lemur, but part of a larger group of primates, Adapoidea, representative of the early haplorhine diversification. Carl Zimmer of The Loom has more comments. Link to the paper at the top. The most comprehensive modeling yet carried out on the likelihood of how much hotter the Earth's climate will get in this century shows that without rapid and massive action, the problem will be about twice as severe as previously estimated six years ago — and could be even worse than that. The study uses the MIT Integrated Global Systems Model, a detailed computer simulation of global economic activity and climate processes that has been developed and refined by the Joint Program on the Science and Policy of Global Change since the early 1990s. The new research involved 400 runs of the model with each run using slight variations in input parameters, selected so that each run has about an equal probability of being correct based on present observations and knowledge. Other research groups have estimated the probabilities of various outcomes, based on variations in the physical response of the climate system itself. But the MIT model is the only one that interactively includes detailed treatment of possible changes in human activities as well — such as the degree of economic growth, with its associated energy use, in different countries. the MIT model, unlike any other, looks in great detail at the effects of economic activity coupled with the effects of atmospheric, oceanic and biological systems. "In that sense, our work is unique," he says. The new projections, published this month in the American Meteorological Society's Journal of Climate, indicate a median probability of surface warming of 5.2 degrees Celsius by 2100, with a 90% probability range of 3.5 to 7.4 degrees. This can be compared to a median projected increase in the 2003 study of just 2.4 degrees. The difference is caused by several factors rather than any single big change. Among these are improved economic modeling and newer economic data showing less chance of low emissions than had been projected in the earlier scenarios. Other changes include accounting for the past masking of underlying warming by the cooling induced by 20th century volcanoes, and for emissions of soot, which can add to the warming effect. In addition, measurements of deep ocean temperature rises, which enable estimates of how fast heat and carbon dioxide are removed from the atmosphere and transferred to the ocean depths, imply lower transfer rates than previously estimated. Now they're getting closer to the accurate POV... 5C. The quest for an HIV vaccine has been given a bad prognosis recently, due to increasing agreement that the human immune system isn't clever enough to outsmart the ever-changing surface of the virus. But now a new approach promises to solve the problem by sidestepping the immune system altogether, instead using gene therapy to produce immune molecules that neutralize the virus. Reporting in Nature Medicine this week, Philip Johnson, a professor of pediatrics at the University of Pennsylvania, in Philadelphia, and his colleagues managed to protect monkeys from infection with the simian immunodeficiency virus (SIV), the animal model that is closest to HIV, by shuttling a gene into their muscles that produces antibody-like molecules that work against SIV. Some antibodies have been shown to neutralize SIV, although exactly how they do this is not well understood. Getting the human immune system produce the few known antibodies that show similar potential for neutralizing HIV has also been impossible. To tackle this problem, Johnson turned to another virus for help. A modified version of the adeno-associated virus (AAV) has been proved to work as a convenient vector for delivering gene snippets safely into the human body for gene therapy, and it has been used successfully to treat hemophilia and congenital blindness by supplying patients with genes that are otherwise missing. The team engineered the immunoadhesin sequences into the AAV vector and injected the constructs into the muscles of nine rhesus macaques, where the muscle cells then started to produce the chimeric antibodies and secrete them into the bloodstream. After four weeks, the team infected the monkeys with SIV and monitored their health along with antibody and virus levels in their blood over one year. Six of the nine macaques showed no sign of SIV infection, and the remaining three did not develop AIDS during the course of the study. In contrast, six control monkeys all became infected, and four of them died before the experiment finished. The results are "really encouraging," says Andrew Sewell of Cardiff University's School of Medicine in the U.K., who was not involved in the study. "I have not seen anything that worked this well before." "This has given us a really big green light in the monkey model, but of course we still need to show this also works in humans," says Johnson. There are four potent antibodies that work against HIV, and it may be possible to use the AAV vector to deliver the necessary genetic sequences for the antibodies in humans. Johnson hopes to get permission to start clinical trials soon and is optimistic that the technique can be adapted to humans. If successful, he says, it could turn into an affordable way to protect against HIV. NEC, hammered by the global recession, is pulling out of a project sponsored by the Japanese government to build the fastest supercomputer in the world. NEC was working with Hitachi and Fujitsu on the project, and Hitachi reportedly pulled out just after NEC’s announcement. The move is the latest by NEC to cut expenses, following the decisions to lay off 20,000 employees and exit the North American PC business. Struggling computing giant NEC is dropping out of a program backed by the Japanese government to build the fastest supercomputer in the world. NEC’s announcement May 14 that it was exiting the Next-Generation Supercomputer Project to help cut costs during the global recession came two days after the company announced that it had lost more than $3 billion during its fiscal year, which ended in March. It’s unclear what impact the defection will have on the supercomputing project. I'd not be too hopeful for teh project's future...NEC out? Hitachi out? I'd bet that Fujitsu will follow soon enough. an interesting contrast here: a chunk of stimulus money in the US was intended to be spent on the HPC industry to try to help it through the economic nastiness. Including to develop new tech as well as keep the company's afloat. Scientists have found the fossil remains in Spain of a new species of mega-shrew that was capable of shooting venom out of blood-colored teeth. The researchers describe the extinct shrew, Dolinasorex glyphodon, as "giant." Its body mass reached only 2.1 ounces (60 grams), but that is about four times heavier than a modern, large-sized member of the same family of insect-eating shrews (the Soricidae), such as the water shrew (Neomys fodiens) which weighs in at around half an ounce (14 grams). The remains also reveal that the red-toothed shrew was capable of "injecting toxic saliva" like snakes do, via a "narrow and conspicuous channel" located on the inside surface of its lower incisors, said Juan Rofes, lead author of a new study of the shrew and a researcher in the Paleontology Department at the University of Zaragoza (UNIZAR). "This was a mechanism very similar to that of the modern solenodons and almiquis, which are close relatives of the shrews and live on the islands of Cuba and Haiti," Rofes told SINC, a Spanish science news and information service. The results of his study are in the April issue of the Zoological Journal of the Linnean Society. 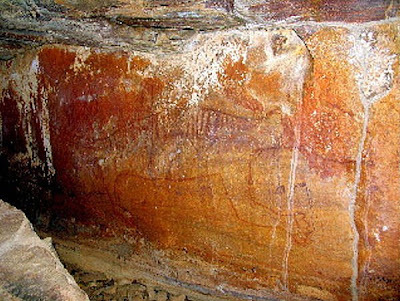 The remains of the strange mammal were found in a deposit in Gran Dolina de Atapuerca, in Burgos, Spain, in layers that date to between 780,000 and 900,000 years ago. The site also is rich in fossils of early humans. The animal was more closely related to eastern Asian than European shrews, Rofes said. It could have arisen and evolved in eastern Asia and then migrated to the Iberian Peninsula, he said. Meeting day. No time to talk. The carnivorous reptiles (Varanus komodoensis) are known to bite prey and release them, leaving them to bleed to death from their wounds: the victims are reported to go into shock before the dragons kill and eat them. Some researchers believe that prey are killed by pathogenic bacteria in the dragons' mouths but the new research – published in the latest issue of Proceedings of the National Academy of Sciences – shows that the combination of the reptiles' teeth and venom likely accounts for their hunting prowess. The researchers used computer modeling to analyse the Komodo dragon bite and found that dragons have much weaker bites than crocodiles of a similar size. However, magnetic resonance imaging revealed the dragons have complex venom glands as well. After surgically excising the glands from a terminally ill dragon in a zoo, the researchers used mass spectrometry to obtain a profile of the venom, finding that the toxin was similar to that of the Gila monster and many snakes. The venom causes a severe loss in blood pressure by preventing blood clotting and widening blood vessels, thus inducing shock in a victim. The paper when it's available will be here. Philip Gingerich, president-elect of the Paleontological Society in the U.S., has co-written a paper that will detail next week the latest fossil discovery in Public Library of Science, a peer-reviewed, online journal. "This discovery brings a forgotten group into focus as a possible ancestor of higher primates," Mr. Gingerich, a professor of paleontology at the University of Michigan, said in an interview. Scientists won't necessarily agree about the details either. "Lemur advocates will be delighted, but tarsier advocates will be underwhelmed" by the new evidence, says Tim White, a paleontologist at the University of California, Berkeley. "The debate will persist." The skeleton will be unveiled at New York City's American Museum of Natural History next Tuesday by Mayor Michael Bloomberg and an international team involved in the discovery. According to Prof. Gingerich, the fossilized remains are of a young female adapid. The skeleton was unearthed by collectors about two years ago and has been kept tightly under wraps since then, in an unusual feat of scientific secrecy. Prof. Gingerich said he had twice examined the adapid skeleton, which was "a complete, spectacular fossil." The completeness of the preserved skeleton is crucial, because most previously found fossils of ancient primates were small finds, such as teeth and jawbones. It was found in the Messel Shale Pit, a disused quarry near Frankfurt, Germany. The pit has long been a World Heritage Site and is the source of a number of well-preserved fossils from the middle Eocene epoch, some 50 million years ago. Any chance one our east coasters will live blog this? The geologic faults responsible for the rise of the eastern Andes mountains in Colombia became active 25 million years ago—18 million years before the previously accepted start date for the Andes' rise, according to researchers at the Smithsonian Tropical Research Institute in Panama, the University of Potsdam in Germany and Ecopetrol in Colombia. The team integrated new geologic maps that illustrate tectonic thrusting and faulting, information about the origins and movements of sediments and the location and age of plant pollen in the sediments, as well as zircon-fission track analysis to provide an unusually thorough description of basin and range formation. As mountain ranges rise, rainfall and erosion wash minerals like zircon from rocks of volcanic origin into adjacent basins, where they accumulate to form sedimentary rocks. Zircon contains traces of uranium. As the uranium decays, trails of radiation damage accumulate in the zircon crystals. At high temperatures, fission tracks disappear like the mark of a knife disappears from a soft block of butter. By counting the microscopic fission tracks in zircon minerals, researchers can tell how long ago sediments formed and how deeply they were buried. Classification of nearly 17,000 pollen grains made it possible to clearly delimit the age of sedimentary layers. Apart from two wandering rovers, there's not much going on the martian surface these days. In fact, scientists believe the planet has been relatively dead for the past 3.5 billion years. But new research suggests that in at least one place, water gushed over Mars's surface less than 1 billion years ago. The finding increases the likelihood that life may have existed relatively recently there. 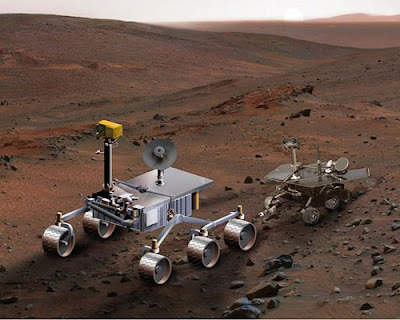 In 2004, the twin Mars rovers, Spirit and Opportunity, confirmed scientists' suspicions that water covered much of the martian surface from about 4.5 to 3.75 billion years ago, when it was a much warmer planet (ScienceNOW, 16 December 2004). After that time, Mars cooled down and dried up. Scientists have found evidence of flowing water, as revealed by gullies that formed over the past few million years (ScienceNOW, 22 June 2000), but the amount of water has been relatively small, and where the water came from is still unknown. 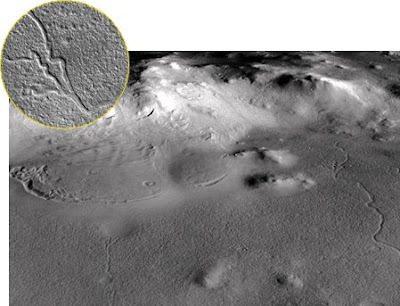 Now researchers have evidence that rivers, tens of kilometers in length and about 250 meters across, carved valleys up to 20 meters deep across the martian landscape. Planetary geologist Jay Dickson of Brown University and colleagues looked at a 7000-meter-deep depression in the martian surface known as the Lyot crater. Situated at about the same latitude as southern Canada in Mars's northern hemisphere, the crater contains buried glaciers and has a current average temperature of –16°C. But its location in the mid-latitudes could have seen temperatures up to 15°C during times when Mars was tilted more toward the sun than it is today, Dickson says. And because the crater is so deep, the atmospheric pressure is high enough to allow ice to melt, instead of turning into a vapor as it typically does over the rest of the planet. Using high-resolution images from the Mars Reconnaissance Orbiter, a spacecraft that orbits the planet, Dickson's group zoomed in on the eastern half of the crater and discovered about 20 winding valleys and a number of deposited materials typically found at the end of rivers. Counting the number of impact craters on the surface (the older the surface, the more impact craters it will have), the researchers managed to date the surface to about 1 billion years old. That means that the rivers must have formed after this time, the team reports in the last issue of Geophysical Research Letters. Industry is being asked to propose concepts for reusable launch vehicles that could be used for a range of Defense Department requirements, from suborbital flights to heavy-lift missions. The Reusable Booster System (RBS) request for information (RFI) issued by the U.S. Air Force Research Laboratory (AFRL) is a step toward the possible X-plane flight demonstration of a lower-cost, more-responsive launch vehicle combining a reusable first stage and expendable upper stage. According to the solicitation, the RFI's objective "is to identify potential operational RBS concepts, including the family of expendable stage variants, and feasible system development approaches." The plan is to conduct an integrated demonstration of technologies and processes culminating in a subscale X-plane vehicle that would fly by 2017-18 and take the concept to a technology readiness level of 6, ready to enter full-scale development. AFRL has several ground-based experiments already under way involving structures, controls and systems for an operationally responsive launch vehicle. The work is focused on a reference concept for an unmanned vertical takeoff and horizontal landing reusable booster capable of turnaround in 24-48 hours and launch within 4-8 hours of a request. After release of the expandable upper stage, the reusable booster would use its rocket engines to perform an autonomous post-staging maneuver, called "rocket-back," to orient and position the vehicle for a gliding landing near the launch site. AFRL's reference concept includes an integral all-composite airframe and tank structure that carries both internal pressure and external flight loads. The concept vehicle is powered by pump-fed liquid-oxygen/hydrocarbon rocket engines. While other vehicle concepts can be proposed in response to the RFI, the solicitation says "it is preferred for the flight demonstrator to use a previously developed main engine ... [with a] configuration similar to the expected operational system." The RFI seeks a description of the vehicle concept, including ground systems and technology options; a concept of operations, including mission capabilities and costs; a development approach, including costs, risks and timelines; and potential synergies with other military and civil applications of the reusable booster and expendable stages. In addition, the solicitation seeks ideas for demonstration projects in the areas of airframe, engines, control and health management, power, fluid, thermal and actuation subsystems, ground support and system integration. Again, no time to comment. Too busy. Forget the battlefield radios, the combat PDAs or even infantry hand signals. When the soldiers of the future want to communicate, they’ll read each other’s minds. At least, that’s the hope of researchers at the Pentagon’s mad-science division Darpa. The agency’s budget for the next fiscal year includes $4 million to start up a program called Silent Talk. The goal is to “allow user-to-user communication on the battlefield without the use of vocalized speech through analysis of neural signals.” That’s on top of the $4 million the Army handed out last year to the University of California to investigate the potential for computer-mediated telepathy. Before being vocalized, speech exists as word-specific neural signals in the mind. Darpa wants to develop technology that would detect these signals of “pre-speech,” analyze them, and then transmit the statement to an intended interlocutor. Darpa plans to use EEG to read the brain waves. It’s a technique they’re also testing in a project to devise mind-reading binoculars that alert soldiers to threats faster the conscious mind can process them. Wow. Think about the possibilities! The analysis of a termite entombed for 100 million years in an ancient piece of amber has revealed the oldest example of "mutualism" ever discovered between an animal and microorganism, and also shows the unusual biology that helped make this one of the most successful, although frequently despised insect groups in the world. The findings were made by George Poinar, an Oregon State University researcher and international expert on life forms found in amber. It was just published in Parasites and Vectors, a professional journal. This particular termite was probably flying around while mating in a wet, humid tropical forest in what is now Myanmar during the Early Cretaceous period – the age of the dinosaurs. It may have been attacked by a bird or somehow torn open, and then it dropped into the sticky, oozing tree sap that would later become amber, providing an opportunity for the biology of this ancient insect to be revealed in a way that would otherwise have been impossible. Out of its wounded abdomen spilled a range of protozoa, which even then were providing a key function for the termite – they helped it to digest wood. Between animals and microorganisms, this is the earliest example ever discovered of "mutualism," which is one type of symbiotic relationship in which two species help each other. "Termites live on cellulose, mostly from the dead wood they chew, but they depend on protozoa in their gut to provide the enzymes that can digest the wood," Poinar said. "These protozoa would die outside of the termite, and the termite would starve if it didn't have the protozoa to aid in digestion. In this case they depend on each other for survival." Even more primitive termites may have fed on a range of things they could digest themselves, Poinar said, but eventually they acquired protozoa that dramatically increased their ability to digest cellulose, and through evolutionary processes they came to depend on it. Today, modern termites are one of the world's most pervasive and successful insect groups, with about 2,300 known species, mostly in tropical settings, busily at work chewing wood or other plant fiber that protozoa help to digest. They have important ecological roles, helping to create habitat, build soil fertility, recycle nutrients and serve as food for many predators. As a social species similar to ants, some colonies can have 20 million individual insects. And they also cause massive amounts of damage every year to wood structures in much of the world. Their dependence on these protozoa is now well understood, and the process isn't always pretty. Somewhere on the evolutionary scale the termites began producing a liquid that contained protozoa that they would excrete. The termite offspring in turn consume the feces and thereby gain the protozoa in their digestive systems. It took time for all of this to get worked out, the study indicated. The successful establishment of protozoa in the termites required them to withstand the chemical and physical conditions inside the alimentary tract, use the gut contents as a food source, cause no damage to the host and be carried through successive stages and generations. But by the different species each specializing at what they do best – the termite eats, the protozoa digests – the two groups have both had extraordinary evolutionary success. "The relationship between termites and protozoa is very close and has been stabilized now for a very long time because of its obvious value," Poinar said. "It's exciting to understand that this classic example of mutualism has been going on now for at least 100 million years." As well as outlining this age-old example of mutualism, the new study revealed 10 new fossil flagellate species of protozoa, a new species of termite, a new genus of fossil amoeba and 14 additional trophic and encysted protist stages. The amber that contained the termite used in this study came from a mine first excavated in 2001 in the Hukawng Valley in Myanmar, in a formation that was between 97 and 110 million years old. Has technorati lost its mind...again? Just wondering...sometimes my blog is on there. Sometimes it's not. Anyone else having problems? With Brian's blessing, Zach is going to host The Bone Yard on June 12th. WRITE UP YOUR POSTS! I'd like to see this get revived. The familiar model of Atlantic ocean currents that shows a discrete "conveyor belt" of deep, cold water flowing southward from the Labrador Sea is probably all wet. New research led by Duke University and the Woods Hole Oceanographic Institution relied on an armada of sophisticated floats to show that much of this water, originating in the sea between Newfoundland and Greenland, is diverted generally eastward by the time it flows as far south as Massachusetts. From there it disburses to the depths in complex ways that are difficult to follow. "Everybody always thought this deep flow operated like a conveyor belt, but what we are saying is that concept doesn't hold anymore," said Duke oceanographer Susan Lozier. "So it's going to be more difficult to measure these climate change signals in the deep ocean." And since cold Labrador seawater is thought to influence and perhaps moderate human-caused climate change, this finding may affect the work of global warming forecasters. "To learn more about how the cold deep waters spread, we will need to make more measurements in the deep ocean interior, not just close to the coast where we previously thought the cold water was confined," said Woods Hole's Amy Bower. Lozier, a professor of physical oceanography at Duke's Nicholas School of the Environment and Bower, a senior scientist in the department of physical oceanography at the Woods Hole Institution, are co-principal authors of a report on the findings to be published in the May 14 issue of the research journal Nature. If this pans out, it's really big. Correspondence to: Amy S. Bower1M. Susan Lozier2 Correspondence and requests for materials should be addressed to A.S.B. (Email: abower@whoi.edu) and M.S.L. (Email: mslozier@duke.edu). To understand how our global climate will change in response to natural and anthropogenic forcing, it is essential to determine how quickly and by what pathways climate change signals are transported throughout the global ocean, a vast reservoir for heat and carbon dioxide. Labrador Sea Water (LSW), formed by open ocean convection in the subpolar North Atlantic, is a particularly sensitive indicator of climate change on interannual to decadal timescales1, 2, 3. Hydrographic observations made anywhere along the western boundary of the North Atlantic reveal a core of LSW at intermediate depths advected southward within the Deep Western Boundary Current (DWBC)4, 5, 6, 7, 8, 9. These observations have led to the widely held view that the DWBC is the dominant pathway for the export of LSW from its formation site in the northern North Atlantic towards the Equator10, 11. Here we show that most of the recently ventilated LSW entering the subtropics follows interior, not DWBC, pathways. 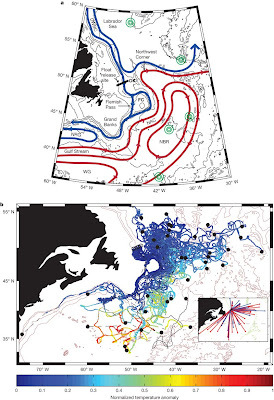 The interior pathways are revealed by trajectories of subsurface RAFOS floats released during the period 2003–2005 that recorded once-daily temperature, pressure and acoustically determined position for two years, and by model-simulated 'e-floats' released in the subpolar DWBC. The evidence points to a few specific locations around the Grand Banks where LSW is most often injected into the interior. These results have implications for deep ocean ventilation and suggest that the interior subtropical gyre should not be ignored when considering the Atlantic meridional overturning circulation. 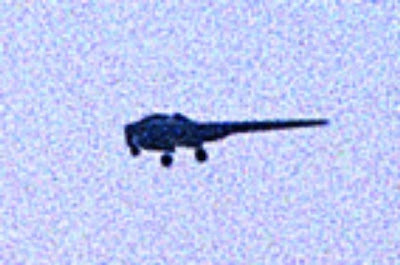 There are reports of a kite shaped one as well. Seen via The Dew Line. Osmium is one of the rarer elements in seawater, with typical concentration of ≈10 × 10−15 g g−1 (5.3 × 10−14 mol kg−1). The osmium isotope composition (187Os/188Os ratio) of deep oceans is 1.05, reflecting a balance between inputs from continental crust (≈1.3) and mantle/cosmic dust (≈0.13). Here, we show that the 187Os/188Os ratios measured in rain and snow collected around the world range from 0.16 to 0.48, much lower than expected (>1), but similar to the isotope composition of ores (≈0.2) that are processed to extract platinum and other metals to be used primarily in automobile catalytic converters. Present-day surface seawater has a lower 187Os/188Os ratio (≈0.95) than deep waters, suggesting that human activities have altered the isotope composition of the world's oceans and impacted the global geochemical cycle of osmium. The contamination of the surface ocean is particularly remarkable given that osmium has few industrial uses. The pollution may increase with growing demand for platinum-based catalysts. There's another signal of our presence that we'll leave in the rocks long after we're gone. And, no, I don't support the anthropocene idea. Pelosi in Trouble? Or Just Going to Blow Over? Republicans opposing efforts to pursue legal action against government lawyers who signed off on waterboarding and other controversial interrogation techniques used in the wake of 9/11 have settled on a high profile target - House Speaker Nancy Pelosi. In the latest game of "What did she know and when? ", Republicans claim Democrats' outrage is hypocritical because Pelosi and other Democrats were briefed on waterboarding and other "enhanced interrogation techniques" back in 2002 and 2003 and did not raise objections. In an April 23, 2009 press conference, Pelosi was asked if, during the fall of 2002, she and other key members of the Intelligence Committee, were briefed on interrogation methods, including waterboarding. At PolitiFact, we normally would be reluctant to make a Truth-O-Meter ruling in a he-said, she-said situation, but in this case, the evidence goes beyond the competing accounts from Pelosi and Goss. We are persuaded by the CIA timeline, which the agency says is based on "an extensive review of (the CIA's) electronic and hardcopy files." It's also important to note that the timeline that contradicts Pelosi was put together at the behest of an administration controlled by her own party. That document provides compelling -- albeit sparsely worded -- evidence that Pelosi's recollection is incorrect. There may be further evidence on this that emerges in the future. Rep, Pete Hoekstra, R-Mich., the top Republican on the House Intelligence Committee, has asked Director of National Intelligence Dennis Blair and CIA Director Leon Panetta to release the CIA briefing notes that the timeline is based on. We reserve the right to change our ruling if new information emerges that contradicts the CIA timeline, but for now, we rule Pelosi's statement False. Will this actually blow up on Pelosi or is it just some hot air? I've not heard much in the Bay about it either way except on TV...and not on any local channels. Not that I watch local news much. The discovery of a gruesome feeding frenzy that played out 73 million years ago in northwestern Alberta may also lead to the discovery of new dinosaur species in northwestern Alberta. University of Alberta student Tetsuto Miyashita and Frederico Fanti, a paleontology graduate student from Italy, made the discovery near Grande Prairie, 450 kilometres northwest of Edmonton. Miyashita and Fanti came across a nesting site and found the remains of baby, plant-eating dinosaurs and the teeth of a predator. The researchers matched the teeth to a Troodon, a raptor-like dinosaur about two metres in length. This finding has opened new doors in dinosaur research on this part of the continent: "It established that dinosaurs were nesting at this high latitude," said Miyashita. "It also shows for the first time a significant number of Troodons in the area [who] hunted hatchling dinosaurs." Over the course of two summers of field work Miyashita and Fanti began building a theory that Grande Prairie is a "missing link" between known dinosaur species that existed much further to the north and south. "Prior to this there were no localities with a variety of dinosaurs and other animals between Alaska and southern Alberta," said Myiashita. The list of new finds for the area includes armoured and thick-headed plant eaters and fossilized freshwater fish and reptiles. Miyashita says this small pocket of previously undiscovered life could have had interactions that lead to the evolution of new species. "New dinosaurs weren't created by interbreeding," said Miyashita. "Having a variety of dinosaurs in one area creates new ecological interactions such as competition for food and predation. "That can lead to the evolution of a new species." One Grande Prairie dinosaur the researchers suspect is a new species is the Duck bill. Miyashita says unlike the Duck bill found further north in Alaska, the Grande Prairie has a visible bump or crest on its forehead. I wonder what the size difference between the Troodons is there and in Alaska and further south. New hadrosaur! Yeah! Let's increase the diversity!!! So, SGI was bought for a pittance by Rackable Systems...and then changes their name to SGI. Huh. What Tera did with Cray seems to have set a precedent. Now will SGI subsume Rackable like Cray did Tera? Or should we say, "Do a China?" Avrora woke up Lyuda and I around 8. I made Lyuda stay in bed and I made her breakfast. She had coppa and prosciutto, cotswald and a hard, orange cheese that I threw away its wrapper by mistake. She washed it down with sparkling cider. We went to a local kid's museum all day (we'd intended to go to 6 Flags, but holy frakkity frak the traffic or the off ramp convinced us otherwise). We then went to dinner at Miyozen on 40th and San Pablo...and had all we can eat sushi and sashimi. We ate WAAAAY too much. It was really, really good. Lyuda almost can't walk. She declared it an excellent Mommy's Day. She and Avrora are passed out now.